Marcus Green, a senior developer at Titus Learning and our resident Moodle guru, has been selected as a keynote speaker at 2019’s first official MoodleMoot, in Shizuoka, Japan. Below he has written his thoughts on been asked to speak at the event. 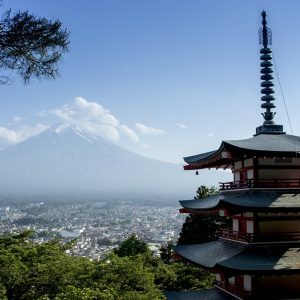 “I am very excited to be making my first ever visit to Japan for the 2019 MoodleMoot along with my partner Sarah. We fly on Saturday 23 Feb at the invitation of the Moodle Association of Japan (MAJ). Japan is a significant centre of Moodle development and I am looking forward to meeting the conference delegates. We have exchanged our pounds for Yen, checked our passports and have been researching all things Japanese. The MoodleMoot Japan has been organised by the Moodle Association of Japan, a national Moodle support network who have met annually since 2008. The MoodleMoot Japan is one of only 8 official Moots to take place annually, and one of only two official Moots to take place in East Asia. It was recognised as an official MoodleMoot due to the fantastic work they have done promoting Moodle use in Japan. Japan is not new territory for Titus, as co-founder Sebastian Francis was in Tokyo last year to meet with clients and members of the MAJ.
To prepare for the trip I have been watching Youtube videos on useful phrases for tourists, but I have not gone beyond; hello, thank you and where is the toilet? I’m incredibly excited to be given this opportunity, ask any of the other Titus staff and they’ll tell you at every Titus meeting for months, I have added a note that ‘I have been working on my Japan trip’. I have been invited as one of the keynote speakers and my topic is on the mobile app and quizzing. My first work, supporting the Mobile App, was made possible by Sojo University Japan, and I will finally be meeting Professor Elton La Clare who arranged for that work to be done. One concern is that I don’t speak Japanese but I have been assured that most of the audience do understand English. The first day of the Moot will be workshops and I will cover the use of Quizzing and the different Question types. There will be a hands on experience with the Student Quiz activity plugin which allows a more collaborative/social approach to quizzing. It allows students to gain points by creating questions, attempting questions and giving feedback on questions created by other students. This plugin is an embodiment of the key Moodle philosophy of learners constructing their knowledge through interaction with others. For my main presentation, I will be talking about how easy my Gapfill and Wordselect questions are for teachers to create content. I will explore how they can create questions not possible in any other question type and their suitability for teaching languages. I will cover the Mobile app and using it in offline mode, with no internet connectivity. It will be the first outing for the 400 re-usable sample English Language questions that ship with my question plugins. There are several other Japan based developers who I have been in contact with and met at Moots in the past, and it is going to be excellent to catch up. Online is great, but there is nothing like meeting people face to face. One of the recent additions to the speaker list is Seishi Ono who has an interest in using blockchain in education, which I consider far more interesting than its use in cryptocurrencies. The MoodleMoot Japan will take place between February 27th – 1st of March and more information about the event can be found here.